Each year The Heritage Council coordinates National Heritage Week with support from the Department of the Environment, Heritage & Local Government & Fáilte Ireland. This year’s events were held between 18th to the 26th of August. Having worked in Irish film for so long there are not many historic building that I have not seen inside. When I looked through the event taking place for heritage week one building that stood out for me was the Freemasons’ Hall on Molesworth Street. It has always intrigued me and growing up I heard so many stories of secrecy the handshakes the passwords and still to this day I know so little about the organisations. We arrived for the 11am tour on Saturday morning, and a lady checked us off the list at the front door and bought us down to the museum room which displays documents, artefacts and regalia providing an insight into Irish Freemasonry history. Our group was made up of around 20 people there were some elderly couples, people in their 30’s and a family which included 2 kids agreed about 11 and 13. After been there for a very short time we were joined by our guide whose name was David. He was very pleasant and after a very quick introduction about himself he asked the group to not be shy and ask him any question we liked we would not embarrass him and to tell him what we knew about the Freemasons. Members of group got straight in there soon the handshakes and the secret passwords were mentioned, followed by resistance from the church, the secrecy surrounding the organisation and it been an all men’s organisation. David agreed with all presumptions surrounding the organisations and stated that he would deal with all those issues and more in greater detail as we went through the building. He then to proceeded to bring us into the Grand Lodge the main room. David was very flamboyant character and spoke about the organisation and the building with passion and edgy excitement almost bursting to get the information out. The Grand lodge is beautiful room, the black and white chequered carpet is very striking almost overpowering. Along both long sides of the room are 2 rows of benches made of a dark rich wood leather covering. There are large picture of previous Grand masters in gilded frames hanging on the walls including one of Edward, Prince of Wales, who visited the Hall in 1871, and was made a Grand Patron of Irish Freemasonry, (one of the older ladies was an encyclopaedia on the Prince, she informed us that he had lost his virginity in the Curragh camp). Above the paintings decorative plaster work with the symbols you would probably associate with the Freemason’s, The Masonic Square and Compasses and the trowel. 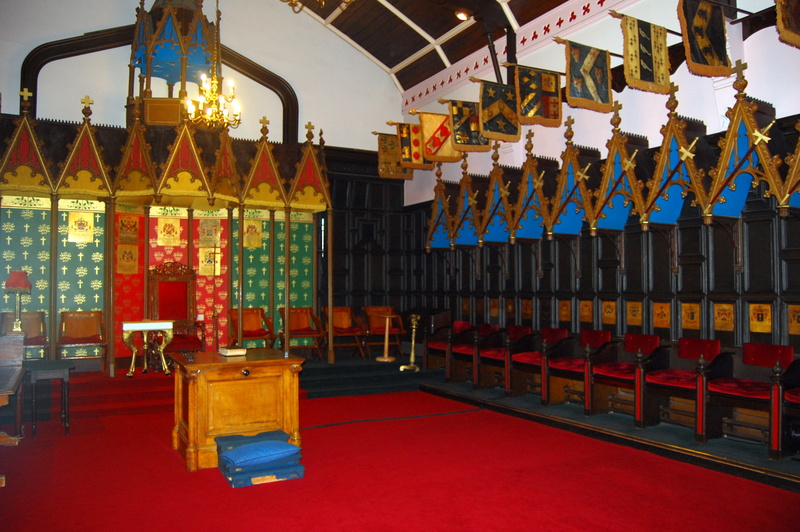 At the top end of the room there is a large imposing chair which dates back to the opening of the building in which the Grand Master sits, the young boy previously mentioned felt really chuffed to be allowed to sit in it. Between the benches there are a number of tables and chairs and one with three candelabra with more symbols attached relating to the freemasons, as well a very large old bible. 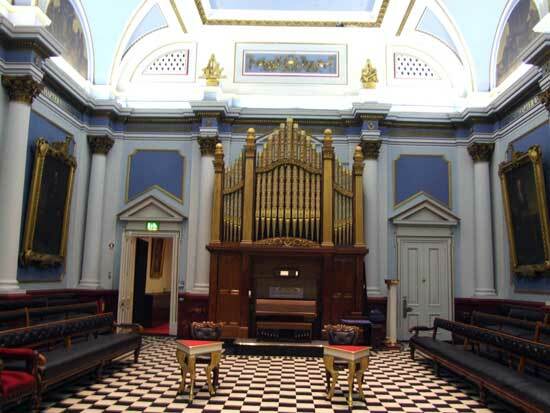 There are many different lodges around Dublin that use Freemasons’ Hall on Molesworth Street but only some can use the Grand lodge for their monthly meetings. David as the head of his lodge said with a glee in his eye he was proud to say that his lodge had use of the Grand Lodge. David answered people’s questions with great detail, particularly relating to issues surrounding the secrecy of the organisation and the strain between Catholic Church and the Freemasons something David made very clear about existed only in Ireland and didn’t exist pre 1900’s. He went on to said if it was a secret organisation it was not doing a very good job, we were on a tour of the building, it’s listed in the phone book and David also talked about the many charitable events it raises money for. The only secrecy in the freemasons is the handshake and some passwords, and he spoke of the freemasons in a gleeful way as being “boy scouts for big boys”. Anyone can join (provide you are male) and believe in a greater being, it’s not religious and there are members from many different faiths among its ranks. On the history of the Freemasons: The Grand Lodge of Ireland is the second oldest in the world and the first evidence for its existence comes from the Dublin Weekly Journal of June 26th 1725. They rented various halls and rooms above pubs and finally at Royal Irish Academy in Dawson Street, before it began work on the building at Molesworth Street. The location was originally the site of the townhouse of its first grandmaster, the Earl of Rosse, which he donated and paid for half of the £10,000 pounds it cost to build it Designed by architect Edward Holmes of Birmingham who was successfully selected following a competition. We heard there were numerous changes to the original exterior which the Grand master had rejected as being over-elaborate and ornate. There were many other highlights on the tour including some stain glass windows on the staircase which were done by Harry Clarke’s father who was a freemason himself. 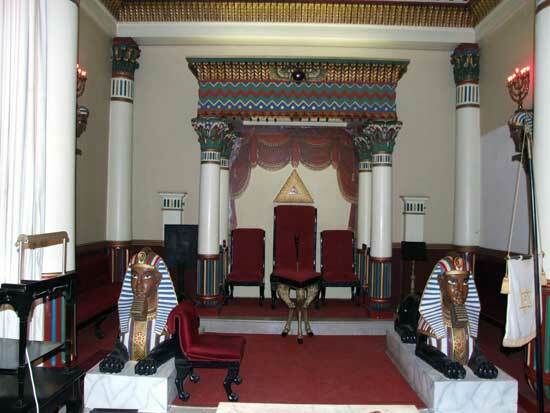 There was the Grand Chapter Room decorated in an Egyptian room style though small in size again was full of symbolism, including a trap door in the floor where more symbols are brought up from a small room beneath the floor during the ceremony. Letting my imagination run wild I could see Harrison Ford head appearing through the trap door with a sack full of jewels just like a scene from one of the Indiana Jones movies. 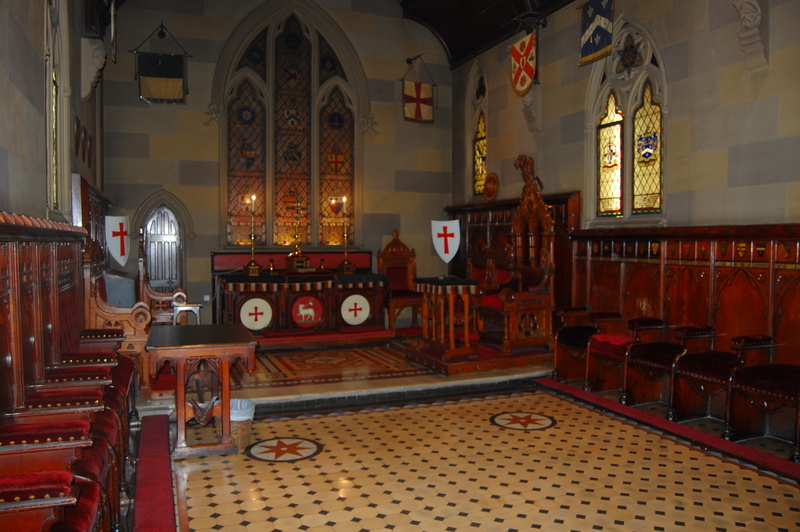 The knights Templar Preceptory room is home to the knights Templar and has some fine detail, but not quite as big as I would have thought both sides of the room are flanked by carved chairs and seats seating around 40 people, above the seats coats of arms and flags abound everywhere. It’s a room built within a room so behind all the stain glass window it was original lights by candles but now lit by electric lighting. This room was not completed for almost a year after the building originally opened. The Prince Masons Room was the final room on the tour at the top of the house it is a mixture of gothic and Tudor style architecture and could have easily fitted into a scene from a Harry Potter movie. David informed us this was the home of the 33degree (the highest rank) and to ever reach that level as a freemason you would be very old as you can only be invited in on the death or resignation of one of its small membership. Later we were given the opportunity to browse in the museum on the ground floor. It was a very enjoyable tour and I would recommend everyone to go and take a look. It opens for public tours on Thursday afternoon through the summer months. For more information visit the Freemasons website. Next up its cultural night Friday 21 September. © Tom Dowling 2012 images by Tom Dowling and from Freemasons website. ‹ The “silly season” is over it’s time to disband the Croke Park Agreenment. Whoa!….Actually-the grand lodge and the prince masons’ room at least-in my opinion-for some reason they seem reminescent of the main room in the newest “Alice in Wonderland”…or for some reason since I have never been there-it’s reminescent for me somewhat of the Douge’s palace in Italy. Great pics/information and I’ll definitely check out the freemasons website when I get a chance! Great blog!